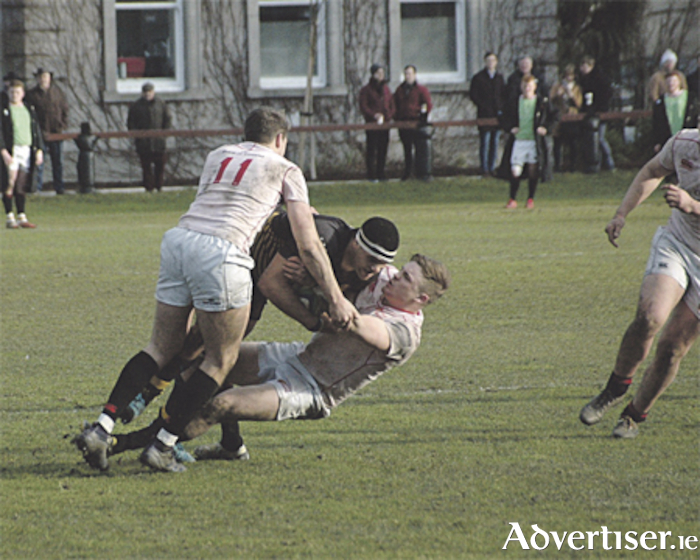 Despite another promising start, Buccaneers once again could not close out a game, as they lost narrowly by 21-17 to Dublin University in their Ulster Bank League Division 1A basement battle at College Park, Dublin, last Saturday. In this must win encounter for both clubs, the Pirates made a perfect start, but failed to add to their tally in the second half. They continue to prop up the league table, eight points adrift of St Mary’s College, whom Dublin University have moved above, giving them a great chance to avoid relegation. Buccaneers made five changes for this crunch encounter. In the pack, Conor Kenny returned to the front row and Simon Meagher to the back row, with Conan O’Donnell and Ruairi Byrne on the bench. Conor McKeon was available to slot in at scrum-half, with Graham Lynch listed among the substitutes, while both wings were changed. Callum Boland returned and former Ulster player Rory Scholes debuted on the right flank. Despite shipping two heavy losses in their previous two fixtures, Dublin University made minimal changes and included Angus Lloyd, Jack McDermott and Paddy Finlay, who have been named in the Ireland Clubs squad to tackle Scotland in Athlone next Friday night. Buccs got off to a flyer in front of a big crowd, with the lively McKeon intercepting smartly in the opening minute to race in for an opportunist try that he converted excellently from wide on the left. Twelve minutes later, Martin Staunton and Evan Galvin led a drive over the home line, only for the referee to deem that the ball was held up. However, the midlanders were utterly dominant in the opening quarter, and their sustained pressure yielded further reward when Cian Romaine stretched over for a 16th minute try. McKeon again converted and Buccs were full value for their 14-0 early advantage. But Trinity got back into the game when Evan Dixon’s break was carried on by Alex MacDonald, and the American lock romped in for a 19th minute try between the posts, making Jack Kelly’s conversion a certainty. Kelly and McKeon traded penalties before The Students scored an uplifting try. After the referee had words with Trinity’s Lloyd and Buccs Dan Law, College punted a penalty to the left corner. Following the lineout, Sam Pim was driven over for an unconverted try in the final move of the half, to leave Trinity only 17-15 in arrears at the break. The midlanders were forced to make an early second half change, with Rory O’Connor coming on for the injured Boland. They had an opportunity to edge five points ahead after 52 minutes, but McKeon’s 35-metre penalty rebounded off the near upright. Buccaneers seemed to be getting back on top and began exerting huge pressure in the third quarter of the game. They pounded the home line and the hosts defended commendably, although James Bollard got away with coming in from the side to boot the ball clear on one occasion, while fullback Kelly just got to a chip ahead before Ben Carty could ground the inviting ball. Once they had weathered that particular storm, The Students swiftly turned to attack, and it was now Buccs turn to tidy up from a kick ahead. Then, Shane Layden got caught in two minds when attempting an ill-judged quick restart and was caught in possession, coughing up a soft 63rd minute penalty, which Tommy Whittle despatched to put Dublin University ahead for the first time. Four minutes later, Conan O’Donnell was yellow carded for slowing possession illegally, and substitute Whittle’s second successful penalty meant Buccs had to chase a third try. They again piled forward and penned The Students inside the home 22, but College seemed to get the vital breaks, and a couple of debatable officiating decisions. The Athlone side just could not penetrate the steadfast Trinity defensive effort, as College held out for a priceless victory. The Dublin University players put their bodies on the line to hang on for their win and owed much also to the probing of scrum-half Lloyd. Sebastian Fromm was another lively back, while the effervescent Finlay led his pack by example. The Buccs players could not be faulted for their effort and commitment, but a lack of real leadership and sheer hardness hindered their cause. Law, Romaine and McKeon were most prominent but, with just four fixtures remaining, relegation is now surely looming for The Pirates.